Jensen Ackles, Misha Collins and Jared Padalecki were at the CW Upfront presentation this week. Several outlets were able to talk to them. The CW announced it's fall schedule for next season and Supernatural will stay on Thursdays. Mark Pedowitz also explained the thinking behind not picking up Wayward Sisters. After the CW announced that the Supernatural spinoff Wayward Sisters would not be picked up, fans began a campaign to change the network's mind. Media outlets covered the story. It breaks my heart to say this, but CW has chosen to pass on Wayward Sisters. We love these characters, and have spent almost two years trying to make this show a reality on the network... but there are some fights, sometimes, you can't win. I want to thank everyone involved in this entire process, from our fantastic crew, to our amazing cast, and, most of all you. Your passion for this idea fueled us, and we wanted so much to make this happen for you. I'm so sorry we couldn't. But know that these characters will live on. We owe them, and you, and us that. After GISHWHES ended this year, Misha Collins announced that it was the final GISHWHES as it had been. Now we know why. GISHWHES has become GISH! As Nerds and Beyond reported you can now use GISH – The App! From Programming Insider (see end of the article for more from Programming Insider). The CW was preempted in New York for sports, which accounts for the drop. Earlier ratings below the cut. Filming for Supernatural Season 13 Has Wrapped! Updated! That's quite a drop from the overnight numbers below. The CW was preempted in New York, other than that, I haven't seen any reason why the change was so large. Many shows were in repeat this week with only Supernatural, Legends of Tomorrow, Black Lightening, Arrow and and Life Sentence being new thus far. 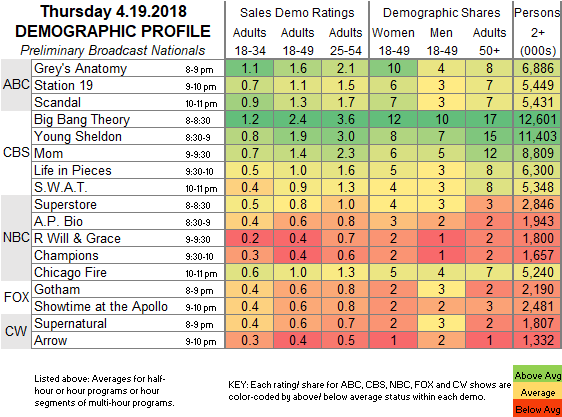 Of those shows, only Black Lightening beat us in the 18-49 demo and Legends of Tomorrow tied us in the same demo. Basically it was a bad week for the CW all around.